The Hungarians are famous for their ability to do deals. It is always surprising to discover how many successful Hungarian businessmen there are around the world. They are right up there with the Lebanese. They have all the energy of the Marx Brothers, which is half the battle. The Hungarian Grand Prix is a classic example of the country's ability to duck and dive, wheel and deal. To begin with there was talk of a Grand Prix many years before it ever happened. In the early 1930s there was a Hungarian Grand Prix listed on the international calendar years before it ever happened. In 1936, however, the deals were done and the Auto Union, Mercedes-Benz and Ferrari teams all turned up and a vast crowd watched them whizzing about in one of Budapest's parks. Tazio Nuvolari won. And then the war came and Communism and the Cold War and it was not until the early 1980s that Hungary came back into the vision of those involved in Grand Prix racing. Hungarians were easier to make a deal with than were the Russians and so Bernie Ecclestone gave up trying to convince the Soviets to let him run cars around Red Square in Moscow and settled for a race in a valley outside Budapest. The first race was held in 1986 and was a groundbreaking event at the time - the crowd was an estimated 200,000 making it the biggest F1 crowd in recent history. The event at the Hungaroring has been a popular race ever since with tens of thousands of Germans, Austrians, Italians and Finns flocking to town. It is all a bit antiquated compared to the modern race tracks in Malaysia or Melbourne but every time the race comes under threat the Hungarians do another deal and everyone is happy. The fact is that Formula 1 would miss Budapest because the city races are always more fun than those which take place in remote tracks out in the country. The town is buzzing with F1 activity and you cannot go anywhere without bumping into someone you know. Bumping into people you know happens quite a lot on the race track as well because the Hungaroring is traditionally narrow and tight. Overtaking is difficult and often in trying to pass those ahead the drivers bump into one another and damage their pristine cars. This means that the emphasis is on qualifying well and on having a good strategy. It is all about tire wear and temperatures. A driver can take pole position with some fireworks but the question is whether or not he can keep up that pace lap after lap. The battle this year between McLaren and Ferrari has often been a question of that because, while Michael Schumacher is often able to pull a rabbit out of his hat in qualifying, the McLaren men have on several occasions been able to wear him down and beat him. The McLaren is probably the better car. Not because it is out and out faster but rather because it uses the tires slightly less than the Ferrari. Qualifying confirmed that pattern with Michael pulling out one of his really special qualifying laps, dancing the car around and doing things which the Ferrari really did not want to do. The result was a lap which was nearly four-tenths faster than David Coulthard's best. "We didn't exactly achieve what we wanted," admitted Mercedes-Benz's F1 boss Norbert Haug. "What is good is the fact that we have the same situation as we experienced at Barcelona and Magny-Cours where we won with well-balanced cars." Coulthard looked very strong, even if Schumacher had beaten him in qualifying. Schumacher said he was delighted but he did not look very delighted. "Qualifying is one thing," he said. "The race is another. I want to get a good result." Having gone out at the first corner in the last two races, Michael needs to get some points on the board if he is to hold back the McLarens in the battle for the World title. He had a lead of more than 20 points a few races ago and that gap is now down to just two points and the McLarens are looking better and better. Rubens Barrichello was not really in the hunt on this occasion, setting the fifth fastest time, eight-tenths of a second slower than Schumacher. Rubens blamed traffic and problems finding a good balance with the car. Schumacher had the same balance problems but extracted more from the car. Coulthard may only be equal on points to Mika Hakkinen but nowadays he is the fastest man in the McLaren. In the last seven races David has outqualified Mika on six occasions and on the seventh Coulthard admitted that he had made a bad mistake on his best lap. Hakkinen said that he was struggling with balance and this was why he was slower than Coulthard. With the two McLaren drivers equal on points and the team still operating its policy of the first man into the first corner being the man who stays ahead, much depended on the start of the race. The big surprise of qualifying was the performance of the Williams-BMW of Ralf Schumacher which was fourth on the grid, eight-tenths off pole position but at the front of the gaggle of second level cars, which were separated by hundredths as they tend to be these days. Ralf was four-tenths ahead of team mate Jenson Button and the difference between the two was four places. Ralf said that the result was a surprise to him and due to the team having developed a stronger engine and new aerodynamics. Button's performance was impressive considering that it was his first visit to the track. "This is a very technical circuit," he said, "very twisty and not easy to memorize. It has a couple of corners where you cannot see the apex clearly so I am very pleased with the result." In amongst the quarrelling bunch was Heinz-Harald Frentzen in his Jordan, sixth fastest with a time that was just a blip slower than Barrichello. Jarno Trulli on the other hand found himself struggling throughout qualifying and emerged a very disappointed 12th. His progress was not aided by damage he did to the car when he ran heavily over a curb on Saturday morning. "One small mistake and you pay the penalty," said Eddie Jordan. Seventh on the grid was pretty much what was expected from Giancarlo Fisichella in his Benetton and with Alexander Wurz 11th, six-tenths slower, it was pretty much normal. The team said that it had expected better grid positions but it is hard to imagine why. Fisichella made a lot of fuss about being held up by Michael Schumacher on his final flying lap. "The appalling driving of the so-called championship contenders cost us dearly," said Pat Symonds, Benetton's technical director. "I am pleased to say that our team is sporting enough to call our drivers in and not spoil other people's laps." And to think that back in the days when Michael was winning the World Championship in controversial circumstances in 1994, Symonds and he were close collaborators. The cynical in the paddock suggested that Michael's blocking of Fisichella might have been related to their unfortunate incident the other day at Hockenheim. Also in amongst the scrambling top 10 was Mika Salo in his Sauber in ninth place. This was a good effort for the Finn and evidence that Sauber is making progress after a poor start to the year. Pedro Diniz was 13th which was pretty much where you would expect to find him. The gap between the two was seven-tenths. "For the sake of two-tenths of a second I could have been sixth," he said. "But ninth is a good place." The top 10 was completed by Eddie Irvine. It was the fourth time this year that Irvine has started in that position and so one can probably say that it is where he is most likely to be. "We did all we could today," he said. "We were out at the right time. I was out on a quick lap at the same time as Michael." This shows that Jaguar Racing is getting its act together but at the same time reflects the size of the job in hand. Eddie was 1.5secs off Michael's pace. Allowing for the fact that Michael is a faster driver than Eddie the Jaguar is still around a second off the pace. Johnny Herbert was down in 17th and complaining of understeer. Johnny was confused. It was not a great weekend for Alain Prost's less than happy equipe. Jean Alesi has recovered from his astronaut training-like accident at Hockenheim and is once again clear in his mind about which way is forwards. He qualified 14th. Nick Heidfeld was so unhappy with the handling of his car that he decided to switch to the spare and so ended up 19th on the grid. Arrows had Pedro de la Rosa 15th and Jos Verstappen 20th. This was rather strange given that de la Rosa was the only man in the field to chose to run on the harder tire compound and he should have been slower than Jos. The team said that it had expected to struggle at the Hungaroring which was a curious justification. The only good thing one could say about it all was that a few years ago Heinz-Harald Frentzen very nearly won the race in 1997 because he chose hard tires and was only deprived of success by a mechanical failure so de la Rosa's decision might pay off on Sunday. But that would depend on the temperature. It was not a good day for British American Racing. Qualifying 16th and 18th when you have factory Honda engines while the men running Mugens are sixth and 12th would seem to suggest that perhaps the BAR chassis could use a little bit of redesign. This happened a couple of weeks ago and so one has to conclude that the car is really not that good. "We are running maximum downforce," explained Jacques Villeneuve, "and it is not enough." At the back as usual were the two Minardis with Marc Gene ahead of Gaston Mazzacane - as one would expect. COME Sunday morning the interest centered not on the weather as has been the case in recent races but rather on what would happen in the first 15 seconds of the race. Would the dirty side of the track make a big difference as it had in the Formula 3000 race on Saturday? Obviously some drivers were worried because in the warm-up they were running down beside the pitwall to try to clear some of the dust from the track. At the start Coulthard did not get away well. "There is definitely a disadvantage here although my start was not as good as Ralf's who was also on the dirty side of the track behind me." On the other side of the road Michael Schumacher did all right but behind him Hakkinen did better. He closed up on the Ferrari and then jinked to the right, where Coulthard should have been, and he was alongside Schumacher as they went into the first corner. Michael did not give him a lot of room, but it was enough. "That's what racing should be," Hakkinen said. "We came round that corner in one piece. We went through the corner at 100 per cent. That is what happens when both drivers do the right thing." Hakkinen was ahead. It was a blow for Ferrari. Behind them there was an even better duel between Coulthard and Ralf Schumacher. "I had a really good battle with Ralf," David said. "Although he was on the inside I gave him room all the way round Turn 1 and he didn't squeeze me off the circuit or anything like that and it meant that we could battle into Turn Two as well. It shows that you can have close racing while fighting for a corner, without having to run into each other." As Hakkinen set off in the lead with Schumacher trying to keep up, Coulthard realized very quickly that all was not well with the handling of the car: the balance was wrong. Perhaps, he said, it was something to do with tire pressures. He just did not know. Whatever it was, it meant that he could not attack the Ferrari and he soon began to drop away, just as Schumacher dropped away from Hakkinen. By the time the first round of pitstops approached Hakkinen had a lead of 10 seconds and Schumacher had seven seconds in hand over Coulthard. The rest of the field, led by Ralf Schumacher was soon left behind. Michael Schumacher was the first to stop on lap 27 while the two McLarens went on until laps 31 and 32. 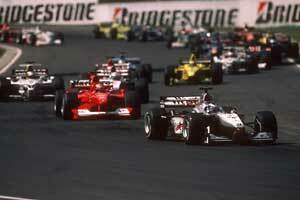 For one brief lap Coulthard led the race but then Hakkinen was ahead again and Michael was back in second. David's second set of tires worked well and he quickly closed the gap to Schumacher. It was down to 1.5secs when he came up to lap Mazzacane for the second time. This cost him time. He closed up again on lap 46 and 47 and then encountered Gene in the other Minardi. He lost over a second. It may not seem much but when it came to the second round of pit stops on lap 51 he emerged a fraction behind Schumacher. That fraction had been lost behind the Minardi. Gene was later given a stop-go for ignoring blue flags, which warn the driver that he is about to be overtaken by a faster car. David did not want to be seen to be complaining after the event but he was annoyed at what had happened. "I don't wish to be disrespectful to Minardi but they are in Formula 1 in name only. Normally there is not a problem but this time they were not looking in their mirrors." It may have been due to the fact that the little Italian team has just lost its sporting director Cesare Fiorio and his replacement was not keeping the drivers as well informed. Whatever the case David was stuck behind Schumacher and stayed there all the way to the flag, hoping that the Ferrari star would make a mistake. It was a vain hope. Neither man, however, could touch Hakkinen and he duly came home to win his third victory of the year to move into the lead in the World Championship. "All the way through the season people seem to have been saying so many different things: they have been saying who is going to win it or who is going to lose it, who has the motivation or who has lost the motivation," Hakkinen said. "I have been keeping my head all the time and concentrating on my work in order to try to win the races. That's what I am going to do for the rest of the season." Schumacher was rather subdued. He had been beaten and beaten well and he knew it. The trend is going against him now. "Today we were not fast enough to win the race," Michael admitted. "When you see his pace you have to say that, if he hadn't overtaken me at the start, he would probably have done it later during the pit stops, because he was simply the fastest man on the circuit today. That's why I am not too unhappy to be in second position, because it was a tight battle with David. We have some good ideas on how to improve our situation." Michael is going to need all the good ideas he can get because right now life is tough for Ferrari. The cars are evenly matched but the McLarens seem to be less hard on their tires. Barrichello came home fourth which was pretty much what was expected of him. He was fifth early on but took advantage of a slightly slow stop for Ralf Schumacher at the first pit stop to get ahead. "I am not sure I could have kept him behind," Ralf admitted. "I must say our car was very good on this track and that helped me." Fifth place was Ralf's reward for a good solid race. Button would probably have finished in the points as well because he was pressuring Frentzen for sixth place in the middle of the race but then his engine began to lose power here and there. It was not a consistent problem but came and went and so his top speed was badly affected on number of occasions. His lap times reflected this and gradually his chasers closed in and during the closing laps he dropped to ninth place. "I drove as hard as I could, but there nothing I could do." said Jenson. "He drove like a tiger," said Frank Williams. Button's problems meant that Frentzen was left unchallenged in sixth place. It was a tough race but he came away with a point. Team mate Trulli drove a much more impressive race having taken the risky decision to go for a one-stop strategy. This worked in his favor. Early on the Jordan was heavy and slow but Jarno drove it carefully, looking after the tires as best he could. He ran 12th and did not seem to be going anywhere. His plan only became obvious when those around him stopped for the first stops. Trulli kept going in ninth place. When he stopped on lap 43 he dropped back to 12th but those ahead had to stop again and when they did he rose through the order again to run eighth. In the closing laps Button could do nothing to stop him and Jarno slipped into seventh place with three laps to go. Two laps later Button fell behind Eddie Irvine as well. Irvine was irate because he had lost a lot of time in the middle of the race stuck behind Gene's Minardi. Eddie felt it had cost him two places. The lap by lap data suggested that one place might have changed hands. Still the comments did no harm given that Ford Motor Company President Jac Nasser was there to watch. Johnny Herbert's race was spoiled by gearbox glitches which caused him to spin twice while trying to hold off attacks from others. The problem eventually caused him to retire. "Not very enjoyable," said Johnny. Salo finished 10th in his Sauber and given that he had started ninth it was hardly the dream result. Mika had started well but he was slowed up in the first corner and had to brake and the loss of momentum meant that he ended the first lap in 11th place. He too complained about Minardis. Pedro Diniz made a better start and ran 12th early on. He was up to ninth in the closing laps when his car stopped. Benetton had a similarly bad day. Fisichella ran seventh until he went for a spin on lap eight when he hit trouble with the brake balance. He rejoined and then ran wide again on lap 12. By the time he was back on the track again he was down in 14th place and on lap 15 headed for the pits to have his barge boards changed. He messed around at the back for a while and then decided to give up. "The car was too hard to drive," he said. Alexander Wurz came home 11th. He started in the same position. "A tough and disappointing race," he said. British American Racing did not have a day to write home about. On the first lap Villeneuve had a bingle with de la Rosa and in doing so left his front wing assembly at the chicane. A pit stop followed for repairs. The BAR looked quite quick after that and he soon retook de la Rosa. He zipped past the fading Fisichella and twice overtook Zonta but finishing 12th two laps down is not really the way to make headlines. Zonta ran without any extra pit stops or any incidents of note and so one must question why he ended up 14th. Verstappen's Arrows ended up between the two BARs and de la Rosa ended up dead last. This was not the stuff of legend. One wonders whether next year will be any better. Prost's adventures in Hungary were dismal. Alesi retired after 11 laps because there was no point in going on as the result of a series of pit stops failed to cure a steering problem. Heidfeld retired after 22 laps when he came in and the car stopped as he tried to power away from the pit. The car was pushed to the end of the pitlane where it wept, leaving a sad puddle of liquid on the tarmac. Oh well, as they say in F1, for sure things will be better in the morning.